These healthy pumpkin brownies are a great way to enjoy a low-fat, low sugar treat with Fall’s favorite vegetable! I couldn’t let pumpkin season pass by without serving up an associated low sugar brownie! What kind of friendly food blogger would I be if I didn’t, I ask you? 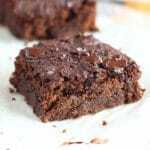 I clarified this recipe to be ‘from scratch’ as there is a popular Weight Watchers recipe calling for just two ingredients: pumpkin and a box of brownie mix. Hey, no judgment from this girl. I think we all have to go through our ‘unhealthy’ stage in life and feel the difference between a fast food way of living versus a more homemade approach. 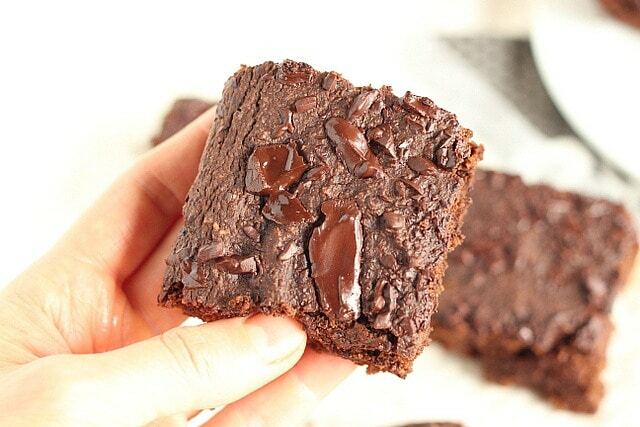 In our early years of marriage, when I worked at Whole Foods, my husband and I used to buy a gluten-free brownie mix from the store, and at the time, I felt like I was really making a superior choice. It’s only been in more recent years that I’ve really started dealing with blood sugar and emotional issues from too much sugar, even in the form of the ‘unrefined’. In the end, it’s just not worth it for me to have much of any sweetener, so I’ve been on a mission to recreate my favorites without it. I think one major key with low sugar baking is texture. You can’t have a dry, crumbly, tasteless cookie or brownie AND no sugar. Who wants to eat that?? But!…in my retrained sweet tooth’s opinion, you can kind of ‘trick’ yourself into thinking you’re having a treat. I’ve learned so many foods have a natural sweetness that really shines through if you take the time to learn. Oats, coconut, fresh fruit purees, cinnamon, vanilla…these all contribute to a great low sugar recipe, in terms of ‘sweetness’. I’m also not shy about added fat, which can help greatly in terms of texture. Having said that, this recipe, ironically, has NO added fat, either in the form of butter, oil, or nut/seed butter. I’ve tried it with, and I really notice no difference, so why add it? If you want to enjoy this with some fat, whip up this Peanut Butter Frosting and serve it atop. Obviously, you can use whatever nut or seed butter you wish. Even though there is zero added oils and very little added sweetener, this recipe rocks the socks in terms of texture. 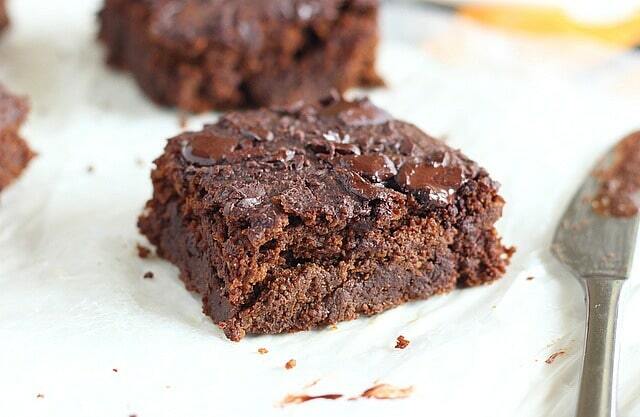 Can it be cakey, yet fudgy at the same time?…Because that’s how I’d describe these. 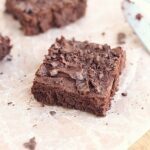 While I’m usually on team ‘little to no leavening agent’ for brownie recipes, I find that the addition of baking powder/soda is enough to combat what can be a bitter cocoa taste and give the brownie just enough rise without falling into the ‘cake’ category. If you’re still retraining your sweet tooth and can’t imagine a nearly sugar-free brownie, try telling yourself that it’s chocolate ‘bread’. That may get you over the initial ‘hump’ of trying a less sweet brownie. Though it may seem unfathomable, I actually look FORWARD to my low sugar treats! Now, they actually give me energy, instead of zapping it away. I like to top this off with a drizzle of full-fat yogurt and a big sprinkle of cinnamon. Another note…a trick that may help here is to top it off with your favorite chocolate chips. That way, you at least get that top layer of sweetness, and it helps with the transition to lower sugar eating. In addition, you could add an almond butter drizzle made of almond butter, coconut milk, and some honey! Layering can be so important to take the edge off, so to speak. I hope some of you give it a shot! 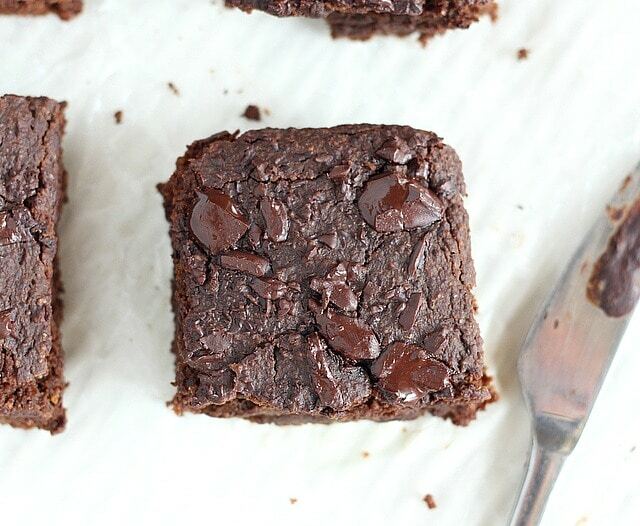 These low-fat, low sugar brownies are a fudgy-cakey treat that are surprisingly decadent! Mix the dry ingredients together in a large bowl (flours, cocoa, baking powder/soda, salt). 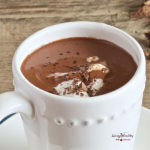 Add the wet ingredients directly into the same bowl, stirring until well combined (reserve the chocolate for the top, if desired). Oil an 8 x 8 baking dish. Pour the batter into the dish and spread it out evenly. Bake 15-18 minutes or until a knife comes out clean. Don't overbake them or they will be dry! You can omit the oat flour and just use 3/4 cup spelt flour, if desired. If you’re not a fan of molasses, maple syrup or honey can be substituted. I haven’t tried these with either of those, so I’m not sure. I think Bob’s Red Mill makes a 1-to-1 GF flour that subs well for wheat or spelt. YUMMMMM!!! I too have been following your low sugar journey. 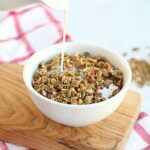 It has been the best decision ive ever made diet wise and i have your delicious recipes to thank! Thank you Lauren!